A cell is enclosed in a lipid bi-layer membrane which serves as a reaction chamber for the biochemical processes of life. Within the cell there are various organelles such as the nucleus, mitochondria and so on which too are surrounded by membranes. In order for the cell to function, some but not all bio-molecules must be able to cross the membrane. This usually happens through proteins that form pores on these membranes. These pores are very small, often a nanometer or so in size. They serve as border "check points" for the intra-cellular and intra-organelle "traffic". Many important bio-molecules are long chain polymers e.g. DNA, RNA and proteins. The physical process by which such polymers cross membranes is of importance for understanding how cells function. As in other areas of science, real insight is often gained by studying an effect in isolation free of the influences of non-essential phenomena. Biologists call this "in vitro" experiments (in vitro = in the test tube as opposed to inside a living organism or "in vivo"). In 1996, Kasianowicz et al. published a very beautiful in vitro experiment that mimicked the natural process of polymer translocation across membranes. A version of the experiment (figure taken from the later paper by Meller et al.) is shown in the left. A natural protein that goes by the name of "alpha-hemolysin" was extracted from the "staph" bacteria Staphylococcus aureus. This protein is a heptamer - it comes in seven parts like Leggo pieces. When the pieces are absorbed on to a lipid membrane, they self assemble forming a pore. 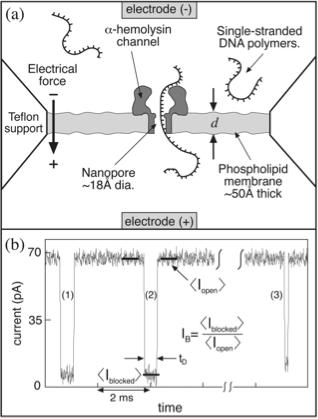 In the experimental set-up the lipid membrane formed the partition between two baths containing salt water across which an electric voltage was applied. The assembly of the pore was signaled by the current that would start to flow as soon as a conducting path through the membrane was established. When a small amount of DNA was added to the negative side of the bath, every now and then, the electric field would shoot a DNA molecule through the pore (DNA being negatively charged). Each time this happened, the pore would be transiently blocked creating a dip in the current signal. The current is "quantized" that is, it only takes one of two values the low one when the DNA is in the pore and the high one when it is out. The signal contains information about the length of the DNA strand, the density of DNA in the cell and perhaps even the identity of the bases of the DNA. This pioneering paper has led to a flood of experimental work refining the technique which has come to be known as "the resistive pulse technique". The idea that the method can be refined to directly read the base sequence of DNA has led to a nanotechnology gold rush for the "Thousand Dollar Genome", the goal of sequencing a person's DNA at a cost of less than a thousand dollars (the Human Genome Project cost 3 billion dollars). Perhaps on a less grand scale, it raises some interesting physics questions such as how fast does the DNA go through? Can this speed be controlled and so on. I will be posting on these issues in future blogs .... so don't go away!